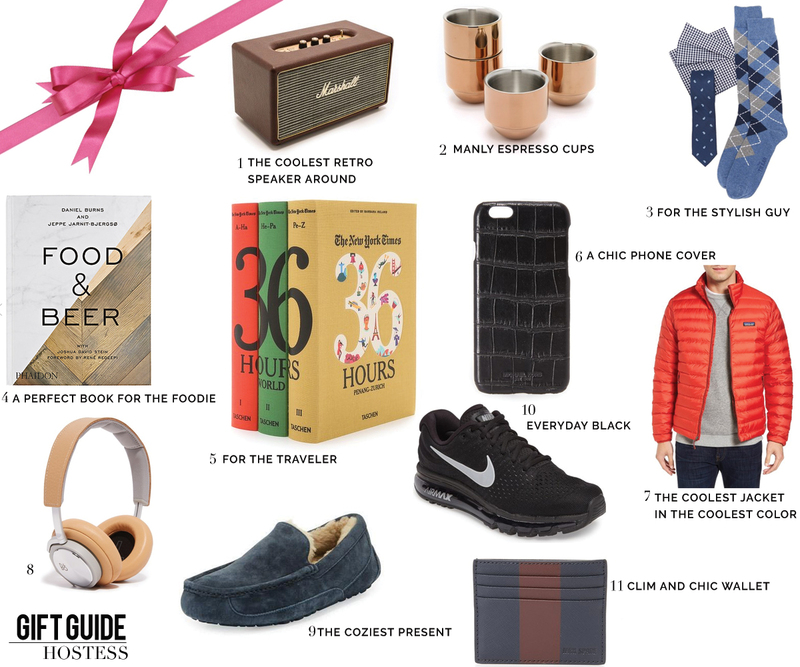 One last gift guide of the season! And this is for HIM- Your dads, brothers, friends. I think they are hard to shop for, hopefully there are some fun ideas you can entertain here and include in your Holiday shopping. one || Retro Speaker. For the guy that loves the retro look but adores high technology. This Marshall compact stereo speaker is designed to look like a classic amp but is loaded with technology. two || Brass Espresso Cups. These stackable Tom Dixon (design genius!) espresso cups are made out of stainless steel and finished with a fabulous high-gloss metal coating. Stylish and practical. three || Handsome Guy Set. This is an ideal gift set for that stylish and traditional guy. Who doesn't love paisley, argyle and gingham together? Too good! and the price is right too! four || Food & Beer Book. Those men who love their beer will also love this book. It elevates beer to high-end dining. There are over 75 recipes and in-depth discussions about beer and how to pair it with food. five || New York Times Travel Guide Set. For the world traveler in your life this Taschen collection of the New York Times “36 Hours” column is the perfect gift. Oh and this handsomely packaged set is not bad on the eyes either. It includes 365 destinations. Let the wanderlust begin. six || Embossed iPhone Case. Elegant and masculine, this perfect case will add style to your man's iPhone. seven || Patagonia Jacket. Windproof, water-resistant, 800-fill-power goose down (read super warm), and packability all in one? How do they do it? It's good! And the color even better. eight || Leather Headphones. These elegant and luxurious headphones from Bang and Olufsen are sleek and cool. Let him listen to his movies and music in style. nine || Ugg Slippers. I think these have been in my gift guide every year....my husband loves them too much. He actually needs new ones this year. They are elegant and so, so cozy. He will love these. ten || Cool Black Sneakers. Comfortable and cool are the perfect adjectives for a gift. eleven || Slim Card Wallet. For nights out in the town he needs a slim wallet with just a couple of credit cards and some cash. This striped Jack Spade card holder in fine saffiano leather is the perfect accessory for this type of occasion. What other ideas manly gift ideas do you have? Love the speaker and earphones! Excellent guide!! Love the Speakers!